You waste time and you know it. You check Facebook. Watch television. Surf the Internet. You’re hardly alone. Most of us engage in these activities from time to time and are totally aware they’re wasteful uses of our time. I’m not worried about those. We choose to dig those graves and enjoy lying in them. What I’m worried about is the graves we unintentionally dig and fall into haphazardly. You should be worried too! I’m talking about wasting time on repetitive activities that we don’t even realize are wasteful. The good news is it’s possible to recognize those activities, decrease the time it takes to complete them, or totally avoid them altogether. I’ll show you how. 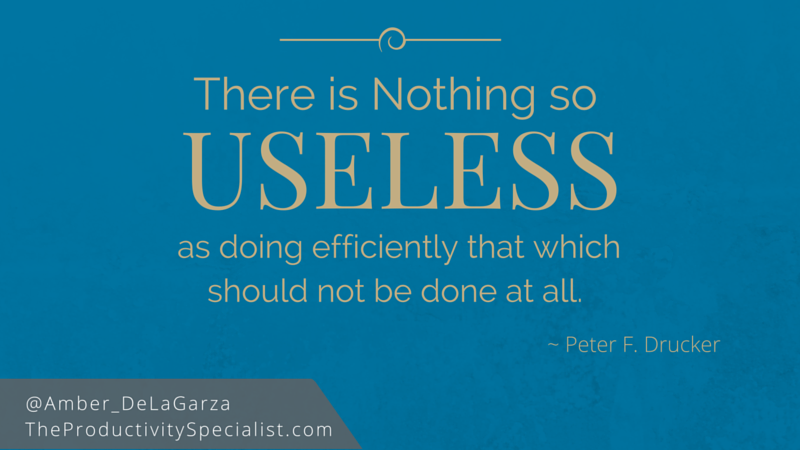 According to Peter Drucker, “There is nothing so useless as doing efficiently that which should not be done at all.” That’s hard to argue to with. Doing something occasionally though, whether or not it’s necessary, is not a huge waste of time. It’s the compounded minutes spent on activities we do all the time, as part of our daily or weekly routine, that really add up. In fact, according to a recent survey sponsored by Office, the “Top Time Killer” is email, followed by meetings. Even though both of these activities are often necessary, the length of time spent engaging in them is not. If you were able to decrease the amount of time you spent checking emails and sitting in meetings by two hours each week, could you use those extra two hours to, oh I don’t know, call new leads, network, or spend time with your family? I think we’d all appreciate a few more hours each week to do the activities that bring us closer to achieving our goals and vision of success without working extra hours. Are you the person who should be doing this activity? No? Delegate it to a qualified person. Are you doing this activity as efficiently as possible? Create a checklist? Easily see which tasks should be accomplished next so you don’t waste time thinking about it. Eliminate steps? Dissect large, multi-step processes. Certain steps may be unnecessary or combined. Change the time of day? Difficult tasks should be completed during periods of maximum focus and energy. If you can minimize or eliminate the activities you do as part of your daily work routine by just 15 minutes, you can reallocate a total of 65 hours per year to activities that lead you toward achieving your goals. Now that’s a perfect reason to stop wasting time on pointless activities! Commit to decreasing the time it takes to complete one step in your daily work routine.